They seem to be among the best in the Ontario Hockey League (OHL) and Canadian Hockey League (CHL) on a yearly basis. Even after losing arguably their three best offensive players prior to the 2016-17 season, the OHL’s London Knights are destined for the playoffs once again. Part of that is the development of their players – the coaching of Dale Hunter and the continued scouting that brings in top-level players. But long before the Hunters took the helm in London, the Knights produced high quality players that drew the ire of NHL clubs. Just look at the long list of former Knights that became first-round picks in their respective NHL Entry Drafts. Established in 1965, the Knights have had 28 players go in the first round of the NHL draft – including 16 since the Hunters bought the team in 2000. With that, here’s a look at the first-round talent that has come out of London over the past 47 years. 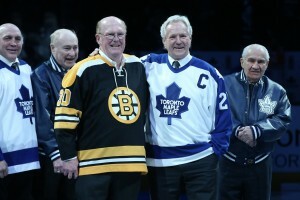 The first Knights alumni to get taken in the first round came back in 1970 when Darryl Sittler was taken eighth overall by the Toronto Maple Leafs. While he only played 107 regular season games for the Knights, he finished his career with 76 goals and 189 points – good enough for 53rd on the franchise’s all-time points list. He added 23 points in 18 playoff games with the Knights and eventually had his number nine retired by the team. Sittler went on to score 484 goals and 1,121 points in just 1,096 regular season games in the NHL with the Leafs, Flyers and Red Wings – adding 74 points in 76 playoff games over his career. One of the biggest highlights from his career was his 10-point game against Boston as a member of the Leafs. While he never won a Stanley Cup, he did win a Canada Cup in 1975-76 and was later inducted into the Hockey Hall of Fame in 1989. He was most recently named to the NHL’s 100 Greatest Players list. Sittler wasn’t the only Knight taken in the first round in 1970. Just six picks later, the Chicago Blackhawks took Dan Maloney 14th overall. Like his teammate, Maloney played 107 regular season games for the Knights from 1968 to 1970. He racked up 43 goals and 106 points over that span – adding seven points in 17 playoff games over those two seasons. He would go on to play 737 regular season games in the NHL with the Blackhawks, Kings, Red Wings and Leafs over 11 seasons. He notched 192 goals and 451 points over that span with just 11 points in 40 career playoff games. Three years later, the Knights would once again see one of their own go in the first round. Dennis Ververgaert was taken third overall by the Vancouver Canucks after three incredible seasons with the Knights. He played 192 regular season games for the Knights, scoring 141 goals and 351 points. That included 147 points in just 63 games during his final season with London. He added 38 points in 29 playoff games and finished as the top scoring right-winger in 1972-73. His 351 regular season points are good enough for sixth on the franchise’s all-time list. Ververgaert went on to play 583 games with the Canucks, Flyers and Capitals, recording 392 points. He saw just eight games of playoff action at the NHL level and contributed just three points. In 1976, the Knights would produce their first top draft pick for the NHL. Rick Green went first overall to the Washington Capitals as a defenceman. On this date in 1976, the #NHL Amateur draft was held in Montreal. The #Caps chose defenseman Rick Green with the first overall pick. He played 199 games with the Knights, scoring 150 points during the regular season. He won the award for Most Outstanding Defenceman in 1975-76 before joining the Capitals the following season. In the NHL, he played 845 games with the Capitals, Canadiens, Red Wings and Islanders. Over that span, he notched 43 goals and 263 points – adding 19 points in 100 playoff games. The following year, the St. Louis Blues grabbed their own Knight when they took Scott Campbell ninth overall. Another defenceman, he played 190 games for the Knights and recorded 117 points during the regular season. Unlike Green, Campbell had some success in the playoffs with London as well. He notched 13 points in 25 games. His NHL career was short-lived. He played just 80 games between the Jets and Blues, recording 25 points. The run of first-round picks continued in 1978 when the Atlanta Flames used their 11th overall pick to take Brad Marsh. Marsh was the third straight first-round defenceman from the Knights taken over the previous three years (following Green and Campbell). He played 269 games with the Knights during the regular season, racking up 153 points. He added 23 postseason points in 36 games for London winning the Most Outstanding Defenceman award in his final season (1977-78) and having his number 22 retired by the club. He debuted with the Flames during the 1978-79 season and it was the beginning of a long NHL career for Marsh. He would go on to play 1,086 regular season games with the Flames (who moved to Calgary in 1980-81), Flyers, Leafs, Red Wings and Senators. He wore a letter in eight seasons including as the captain of the Calgary Flames from 1980 to 1982. He racked up 198 points in his extended career and 24 points in 97 postseason games. The following year marked another first overall pick out of the London Knights’ system. The Colorado Rockies used their number one pick to take Rob Ramage – yet another defenceman from the Knights. Ramage played just 189 games for the Knights, racking up 180 points during the regular season. He added 24 points in 36 career postseason games in London and also won the award for Most Outstanding Defenceman in 1977-78. He also had his number five retired by the Knights which only highlighted his illustrious NHL career. He went on to play 1,044 career games with the Rockies, Blues, Flames, Leafs, North Stars, Lightning, Canadiens and Flyers. He was taken twice in expansion drafts (the North Stars in 1991 and the Lightning in 1992), but managed to collect 564 career points. He added 50 points in 84 postseason games and won two Stanley Cups (1989 with the Flames and 1993 with the Canadiens). It took six years before another Knight was taken in the first round. But in 1985, the Vancouver Canucks grabbed Jim Sandlak with the fourth overall selection. Originally a member of the OHL’s Kitchener Rangers, Sandlak played just one game before joining the Knights. With London, he played 142 games and racked up 125 points over three seasons. He added 22 points in 21 playoff games. From there, he would play 549 games with the Canucks and Whalers totalling 229 points. In 33 playoff games, he added 17 points and was part of the NHL’s All-Rookie Team in 1986-87. In 1987, former Knight Brendan Shanahan was taken second overall by the New Jersey Devils behind only Pierre Turgeon. The Devils took Shanahan after just his second season with the Knights where he scored 67 goals and 154 points in 115 regular season games. He added 10 points in five playoff games and eventually had his number 19 retired by the Knights. His NHL career was nothing less than spectacular. He played 1,524 career regular season games and tallied 1,354 points over that span. His 134 postseason points in 184 games didn’t hurt his chances when he was named to the Hockey Hall of Fame in 2013. He was a three-time Stanley Cup champion (1997, 1998 and 2002 with the Detroit Red Wings) and remains the only player with over 600 goals and 2,000 penalty minutes in his career. On top of that, he unofficially holds the NHL’s record for most Gordie Howe hat tricks during the regular season (17). Following Shanahan, it was another six years before a Knights player was taken in the first round of the NHL draft. It was in 1993 when the Edmonton Oilers took Nick Stajduhar with the 16th pick overall. Stajduhar played 233 regular season games over four years with the Knights and notched 183 points over that time. That includes 61 points in 49 games in 1992-93 and 86 points in 52 games in 1993-94. He had 22 points in 34 playoff games with the Knights, but never won anything with the club. He went on to play just two games for Edmonton Oilers in 1995-96 before his NHL career was over. For the first time ever, Knights were taken back-to-back when Jason Allison was selected one spot after Stajduhar in 1993. The Capitals took Allison with the 17th pick that year. Allison played three seasons with the Knights, including two 100-point seasons. His last full year in junior, he put up 142 points in 56 games in 1993-94. Overall, he racked up 325 points in 202 regular season games and 35 points in 24 postseason games. In 1993-94 he won the OHL Most Outstanding Player award, the OHL Most Sportsmanlike Player while scoring the most points in the league. He also won the award for being the top scorer in the CHL and the CHL’s Player of the Year award. He only ended up playing 552 games in the NHL. Still, he scored 154 goals and 485 points playing with the Capitals, Bruins, Kings and Leafs. He added 25 points in 25 postseason games, before finishing his career in 2005-06. Five years after Stajduhar and Allison were taken, the Flames grabbed Rico Fata with the sixth overall pick in 1998. Fata started his OHL career with the Sault Ste. Marie Greyhounds in 1995-96. Following that season he started his career with the Knights and played 146 games with London – collecting 162 points. His 36 points in 41 playoff games were impressive, but they never amounted to a win for the Knights. He only accumulated 63 points in his short NHL career, playing 230 games with the Flames, Rangers, Penguins, Thrashers and Capitals before heading overseas. Rick Nash was the first Knights player drafted from the Hunter era in London. The Columbus Blue Jackets took Nash first overall in 2002. 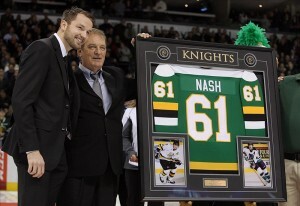 Nash played just 112 games with the Knights over parts of two seasons. He scored 63 goals and 138 points over that span and added 25 points in 16 playoff games for the club. He won the OHL’s Rookie of the Year in 2000-01 as a member of the Knights and had his number retired by the club. So far, he’s played 979 NHL games with 766 points to show for it. In 65 playoff games, he has 36 points with no Cup to show for it just yet. He has only suited up for two teams so far in his NHL career – the Rangers and the Blue Jackets. He won the Maurice Richard Trophy in 2003-04 when he scored 41 goals with the Blue Jackets and continues to put up numbers with the Rangers. Corey Perry was taken the following year with the 28th pick by the, then, Mighty Ducks of Anaheim. He played three seasons with the Knights scoring 380 points in 253 regular season games. He added 88 points in 59 postseason games and seven points in four games in the 2004-05 Memorial Cup tournament helping the Knights win the whole thing. He won a number of awards that season, including the OHL Championship and the Memorial Cup MVP before jumping to the NHL. With Anaheim, he’s notched 710 points in 873 regular season games and 78 points in 97 playoff games. He won the Stanley Cup with the Ducks in 2006-07 and became part of the Triple Gold Club in 2015-16 winning a World Championship gold medal. He remains the all-time points leader in London Knights’ history and likely won’t be giving up that record anytime soon. A teammate of Perry’s, Rob Schremp was taken the following year when the Edmonton Oilers selected him 25th overall in 2004. After playing parts of two seasons with the Mississauga IceDogs, Schremp was moved to the London Knights where he finished his junior career. He played 179 games for London accumulating 304 points in that time. On top of that, he racked up 89 points 52 playoff games, including 47 in 19 games in 2005-06. He was part of the 2004-05 Memorial Cup winning team contributing six points in four games. He won a number of OHL awards as a member of the Knights, but that didn’t translate to the NHL. He played just 114 games between the Oilers, Islanders and Thrashers notching 20 goals and 54 points, but never saw any playoff action. He still sits 13th overall on the Knights’ all-time points list. Three years later, the Chicago Blackhawks drafted Patrick Kane with the first overall selection in 2007. Kane played just one season with the Knights in 2006-07. He played 58 games and racked up 145 points during the regular season – adding 31 in 16 games during their playoff run. While he cleaned up in the awards department, the Knights went on to lose in the Conference Final and Kane went on to join the Blackhawks the following season. His NHL career has been one of success on the ice. He won the Calder Trophy as the league’s top rookie in 2007-08 and is a three-time Stanley Cup champion. So far, he’s scored 739 points in 727 regular season games with 121 points in 123 postseason games with the Hawks. While he only played one season with the Knights, he still sits 78th on their all-time points list. Just five picks later, the Edmonton Oilers selected another Knights player. They grabbed Sam Gagner with the sixth overall pick in 2007. Like Kane, he played just one season with the Knights collecting 118 points in 53 games and 29 points in their 16-game postseason run. He didn’t win the same number of individual awards as his junior teammate, but did join the Oilers the following season. His NHL career hasn’t been as successful either. In 682 regular season games, he has 396 points. And he’s only seen six games of playoff action with two assists to show for it. The New York Rangers got into the mix when they took Michael Del Zotto with the 20th overall pick in 2008. While he played most of his junior career with the Oshawa Generals, Del Zotto joined the Knights at the end of the 2008-09 season for the remaining 28 games. He notched six goals and 30 points and added 19 points in 14 postseason games. He debuted in the NHL in 2009-10 with the Rangers and has since played with the Predators and Flyers as well. He has 183 points in 472 regular season games and 12 points in 32 career playoff games. 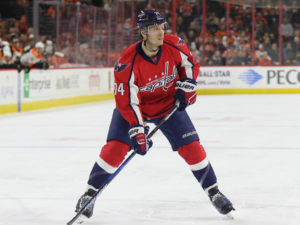 The Capitals also added a Knight in the first round of the 2008 draft taking John Carlson with the 27th overall pick. He played just one season with the Knights, scoring 16 goals and 76 point sin 59 regular season games. He added 22 points in 14 postseason games, but couldn’t help the Knights get it done in the playoffs. He’s since played 517 regular season games with the Caps tallying 263 points over that span. He also has 31 points in 63 career playoff games, but hasn’t tasted the glory of the NHL’s top award yet either. Yet another first overall pick came out of London when the New York Islanders took John Tavares with the top selection in 2009. He played the majority of his junior career with the Oshawa Generals, but joined the Knights in the 2008-09 season to play his final 24 games in the OHL. He notched 32 goals and 50 points in just 24 games with the Knights and added 21 points in 14 games in the playoffs. The Knights lost in the Conference Final and Tavares went on to the NHL. So far, he has 530 points in 579 games in his young NHL career. He’s led the Islanders to the playoffs on three occasions, playing in 24 games and adding 22 points. Six picks later, the Maple Leafs drafted Nazem Kadri with the seventh pick of the 2009 NHL Entry Draft. After playing two seasons with the Kitchener Rangers, he joined the Knights for the 2008-09 season and ended up playing 112 games with the London franchise. He racked up 171 points over those two seasons and remains 59th on the team’s all-time points list. He added 48 points in 26 playoff games with the Knights, but couldn’t get past the Conference Final. He’s starting to learn his role with the Leafs, but has 247 points in 394 regular season games in the NHL. He’s seen just seven games of playoff experience while with the Leafs and recorded four points in that time. In 2011, the Tampa Bay Lightning grabbed Vladislav Namestnikov at the tail end of the first round with the 27th overall pick. People love to rip Knights but can't deny ability to prepare kids for pros. Athanasiou, Namestnikov, Tierney having moments in last month. He played just two seasons with the Knights, but accumulated 139 points in 131 games during the regular season. He added 23 points in 25 playoff games with London – including 18 points in 19 games in helping the Knights win the OHL Championship in 2011-12. Unfortunately, the Knights weren’t able to complete the task by winning the Memorial Cup. So far, he’s played just 190 games for the Lightning with 75 points to show for it. He carries 29 games of postseason experience and has four points over that span. A year later, Olli Maatta was scooped up by the Pittsburgh Penguins when they drafted the defenceman with the 22nd pick overall in 2012. He played two seasons with the Knights recording 70 points in 115 regular season games. He added 37 points over 40 postseason games in the OHL and helped the Knights to another OHL championship in 2011-12. While he’s dealt with a number of health issues since joining the Penguins, he’s still managed 64 points in 219 regular season games and 11 assists in 31 playoff games. Oh, and did we mention that he won a Stanley Cup with the Penguins in 2015-16? As part of a trade that sent Cory Schneider to the New Jersey Devils, the Vancouver Canucks were able to draft Bo Horvat with the ninth pick in the 2013 draft. He played 185 games as a member of the Knights and notched 165 points. He also added 38 points in 48 postseason games with his OHL club – helping the Knights to an OHL Championship in the process. He debuted with the Canucks in 2014-15 and has 111 points in 218 games. He has just six games of playoff experience, but recorded a goal and four points in those games. Son of former NHL enforcer, Max Domi was drafted 12th overall out of London by the Arizona Coyotes in 2013. As a Knight, he racked up an impressive 331 points in just 244 regular season games. He added 60 points in 58 postseason games and helped the Knights to two consecutive OHL Championships in 2011-12 and 2012-13. He sits eighth on the franchise’s all-time list for points. With the Coyotes, he’s played an important role as well. He has 83 points in 127 games, but has yet to experience the NHL playoffs. Just four picks after Domi, the Buffalo Sabres took big defenceman Nikita Zadorov with the 16th overall pick in 2013. He played parts of two seasons with the Knights collecting 55 points in 99 games during the regular season and 15 points in 29 playoff games. He was also a part of the OHL-winning Knights team in 2012-13 before jumping to the NHL. Now with the Colorado Avalanche, Zadorov has 28 points in 145 games between the Sabres and the Avs. He, too, has yet to see any NHL playoff action. The Maple Leafs took another Knights player in the first round of the 2015 draft when they selected Mitch Marner fourth overall. An undersized player, Marner excelled with the Knights scoring 301 points in 184 regular season games – including 242 in 120 games over his final two seasons. He won basically every offensive award possible in his final season with the Knights and helped the Knights to an OHL Championship and Memorial Cup in 2015-16 winning the MVP award of both the OHL playoffs and the Memorial Cup tournament. In just his first season with the Leafs, he hasn’t missed a stride. He has 54 points in 63 games with the Leafs and shows no sign of letting up yet. One pick later, the Canucks took Knights defenceman Olli Juolevi with the fifth overall pick in the 2016 draft. Still playing with his OHL club, he has 83 points in 112 games with the London franchise. His 14 points in 18 playoff games are also impressive and he had seven assists in four games while helping the Knights to the Memorial Cup in 2015-16. The third of four Knights to go in the first round of the 2016 draft, the Calgary Flames made it back-to-back-to-back when they took Matthew Tkachuk with the sixth overall selection. 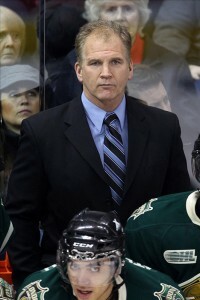 Tkachuk played just one season with the Knights, scoring 30 goals and 107 points in 57 games during the regular season. He added 40 points in just 18 games on their way to the OHL Championship and eight points in four games during the Memorial Cup tournament. Like Marner, he’s finding success in the NHL. In his first season with the Flames, he has 44 points in 65 games and is flying under the radar in the Calder Trophy race. Heck, he even has 94 penalty minutes to go along with it. Finally, with the 24th pick in the 2016 draft the Anaheim Ducks took Max Jones making it four Knights to go in the first round. Jones plays with a lot of edge and because of that misses significant time thanks to penalties and other disciplinary action. That said, he still has 84 points in 93 games for the Knights during the regular season and two points in six postseason games. He did add four points in four Memorial Cup games in 2015-16 and will look to lead them back to the tournament in 2016-17. While it’s clear the Knights have some great development, don’t expect another four players to be taken out of London in the first round of this year’s NHL draft. But don’t be surprised to see a guy like Robbie Thomas get his name called in the first 31 picks when the draft kicks off later this year.